Here we are at the end of two huge GreazeFest weekends in Brisbane and Melbourne. For the GreazeFest crew, the weekends are so busy that they fly by in the blink of an eye, and it seems like a long time ago that we were all hanging out together. The Brisbane GreazeFest laid out an eye-candy spectacle with fins, chrome, tikis, pompadours and parasols all facing skywards, basking in the sunny conditions. The kulture vultures descended to enjoy the bands, the djs, the dancing, the parades and the workshops. The art show in Brisbane was the best we’ve ever seen in GreazeFest history and the Skate Deck art challenge was remarkable in both cities. Melbourne sure has embraced the GreazeFest after our inaugural event last year, and gave us a huge welcome with hot rods and classics all over the place, and greazers and gals turning out in their finest threads. By Sunday the sun came out and the hot rod show hit the full mark, meaning we had to wait for one car to leave before we could fit another car in. As well as the dozens of talented and wonderful bands from the two festivals, we staged a GreazeFest Supergroup and gathered together guest artists from across Australia, America and Sweden for a special performance. So many people have commented to me about how much they loved the Supergroup, and must agree, I had goose-bumps when I watched these talented cats perform together. Here’s a big thank you to everyone who displayed a vehicle in either Brisbane or Melbourne, and sometimes both! Your contribution to the festivals and your sensational vehicles are much respected, and also quite awe-inspiring. 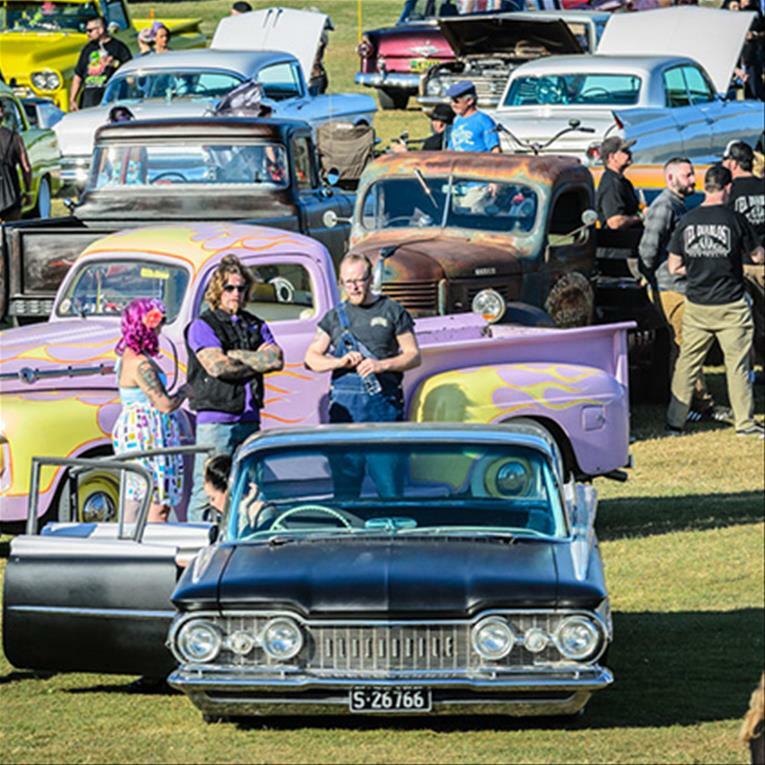 Here’s a big thank you to both Rocklea Showground and Sandown Racecourse for letting us turn their everyday digs into kustom kulture havens for the past two weekends. Thank you to everyone who helped build and run the GreazeFests, including Johnny, BJ, Miss Teresa, Simon Homer, Kylie Lovejoy, Brendan Wright, Michael Hall, Lyn Bennett, Kamakazi and the Beatniks, Wayne McGregor, Garry Halliwell, Chucky, Matt & Misha, Pasi, Chrissy & Ray Keepence, Watango, Mimsy, Luke Muller, Mez, Jon, Rob & Pete Walker, Wes Foster, Kimmy D, Kat & Matt, Brett England, Von Hot Rod, Cherry Dollface, Dickies, Sailor Jerry and our hundred or more GreazeFest team members (I love my team). Thanks also to the bands and djs from all parts of the world and Australia who keep the GreazeFests reelin’ and a-rockin’, plus the wonderful pinups, the fashion parade participants, the tasty food sellers, the kustom kulture artists and those who entered into the skate deck art challenge. It's been 16 years since we created our first greazy get together with like-minded kustom kulture folk. Now in 2015, kustom kulture has become huge across the world, and it's a wonderful thing. Friendships, garage projects, music, dancing, art and striping, collecting everything from tikis to tattoos, forming clubs, vintage fashion, pinup fashion, all of these elements can be shared not just with your pals in your backyard, but in friendships all across the globe. In Australia, GreazeFest is where we come together to celebrate these passions, and I’m counting down the days until we do it all again.